Please remember the Potluck is at 2 pm. The annual general meeting will be held Wednesday May 22, 2019 at 7:00 pm - Southhill Senior Center, 3151 E 27th Ave. (Corner of Ray and 27th. ), Spokane, WA. The agenda is as follows. If you wish to add an item to the agenda for discussion, please do so by notifying a board member of the subject no later than May 15, 2019. A quorum is needed to vote on any issue. This is the one time where we get together annually to meet with one another and discuss the future of our club. Please plan to attend. 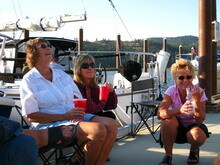 This is a fun get together and great way to kick off the sailing season! 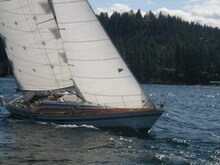 Everyone meets at PYC Saturday at 10:00 a.m. and sails to Harrison to spend the night. Parties, bike riding, and idle conversation are a few of the things to expect on this weekend cruise. Bring a dessert to share on the dock after dinner. Board members flip and stack pancakes to honor the Dads! Sign up sheet will be on the Barbeque Deck. This annual event is for all members, associate members and their families. 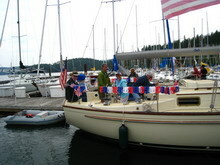 Decorate your boat in red, white and blue, and join us for the long standing parade of sailboats at 10:00 am. The route of the parade takes you past Arrow point and then along the shore of the south side of the top part of the lake. Wave at all the spectators who will watch as we drive past their homes and docks. From there we will head toward the Coeur d' Alene Resort Hotel and wave to all the people on the Coeur d' Alene city beach park. From there we will round Tubbs hill float past the Coeur d' Alene Resort Golf Course and then on to Silver Beach Marina. Once past Silver Beach feel free to raise yours sails and enjoy a great day of sailing. This years judges of the "Best Decorated Boat" are last years winners. They will determine the winner of this years event and present the trophy. Join the pot luck on the barbecue deck. Bring your own spirits and appetizers to share! Everyone rafts up in Beauty Bay and sips their favorite spirits and eats decedent chocolates (or wine coolers and Hershey's Kisses - -your call) while watching the summer's light fade away. Spend the night if you like. 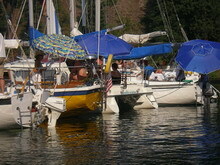 Meet at PYC 10:00 a.m. Saturday and set sail to Harrison to for the last of summer weekend. Bring a dessert to share after dinner. Meet on the Barbeque deck at 12:00 noon. Bring something to grill and something to share. Also please plan on closing down the Barbeque deck after this event by removing all food from the refrigerators and removing all personal items from the area.